Thanks for sharing, two CSA programs meeting and working together! 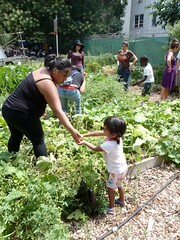 The Brooklyn Bridge CSA kindly helps to subsidize South Bronx CSA shares, spreading access to fresh organic vegetables for all! 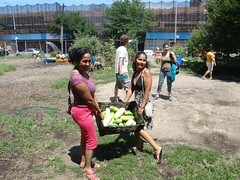 We weeded and harvetsed an abundance of veggies to distribute to volunteers! Collard Greens from the garden! Thanks to JJ from Willis Ave for donating the canoe for this fun pool experience these hot summer days! About our recent victory for navigation of the Bronx Kill, our waterfront efforts in general and more!